To further the rapidly growing competitiveness in the Raid the North series we have developed a national points system to rank all teams competing. We have focused on developing a system that rewards teams for consistent performance relative to the field they are racing against without penalizing teams that are unable to compete in several races per year. Quality, not quantity. Following is an excerpt from our Rules and Regulations detailing the structure we have established. *Time differential is calculated as the difference, in hours, between the team's finishing time and the winning team's finishing time multiplied by a weighting factor (1.5 for 36 hour races). For example, if the winning team finishes in 24 hours exactly and the second place team finishes in 25 hours and 15 minutes, the points for the second place team will be calculated as 40-(1.25*1.5) = 38.125. Any team completing the Advanced Section in a Raid the North (36-hour) race will receive a bonus of 6 points, making the maximum possible points for the winning team 50. For races with no Advanced Section all teams completing the course as ranked teams will receive the bonus 6 points. Each team completing a Raid the North Series Championship race or Raid the North Extreme as an officially ranked team will earn points toward their national standings based on the same structure with two changes: there will be a premium of 16 points added to each finishing team's score due to the difficulty and significance of these races; and, the weighting factor will be 1.0 for the series championship race and 0.5 for Raid the North Extreme. Teams not finishing a race officially will not receive points for that race. Teams competing only in Raid the North Extreme will not be included in the National Points Standings. The team must compete in at least one race in the current season to be included in the current year standings. Points earned at an individual race will only accumulate toward the team's Point Total if the team satisfies the Team Composition Requirements (below). At least one of the three race results used to calculate the team's Point Total must be from the current year. Therefore, if a team did not receive points for a race in the current year, a score of 0 (zero) will be given for one race of the three in their total. Race results from the previous season will be discounted by five points. Race results that are two seasons old will be discounted by ten points. For teams that have completed more than three events, only the best three results (in accordance with all other rules listed here) will count toward their Point Total. No adjustment will be made for teams having finished less than 3 races. Their Point Total will be calculated as if they received 0 (zero) points for one or two races. Teams must officially register a team name and team roster with Frontier Adventure Racing Inc. at the beginning of the season. This is done through the documentation process of registering for a race or, by contacting us directly for the appropriate paperwork. Although not required, some teams may choose to register their team before they register for a specific race to reserve a specific team name. Once a team has registered a team name, they will be the only team permitted to use that team name in Raid the North races for that season. Teams will have right of first refusal on their registered team name for subsequent years. If a team opts not to use that team name for a season, either by not competing or competing under a different name, they forfeit any rights to that name in subsequent years. Points accumulated from competition will remain with the team members, not the team name. Teams may officially change their team name at any time during the season (except during the 4 weeks leading up to a race they are scheduled to compete in), but cannot maintain more than one team name. At least 3 of the 5 official members must compete in each race for that season for the race results to count toward the team's Point Total. There are no restrictions on the 4th person used in a race where only 3 of the official members are competing. A maximum of 2 of the 5 official team members may be changed on a team at the start of each season. If more than 2 members are changed, the team will be considered a new team and points from previous seasons will not count toward the team's Point Total. The following are the 2003 National Standings based on the results of the past three Raid the North seasons using the above points system. 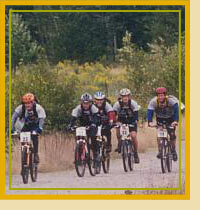 The top 5 teams in the points standings win entry prizing for Raid the North Extreme in 2004. With RTNX serving as the AR World Championship in 2004, the prizing value was honored as a credit towards the World Champs entry fee.